The Thame & District Classic Motor Club (T&DCMC) was formed on June 12th, 1996. As a club we enjoy classic motor vehicles of all kinds. We have members with bicycles, motorbikes, cars, vans, lorries, tractors & even stationary engines, some members have no vehicles at all just fond past memories. Our members have an interest in classic motors. They all enjoy owning, driving & watching classic motors. Some are expert mechanics and do serious motor maintenance and restoration. Some only know a man who can. Most members have one or two classic motors. One has twelve! 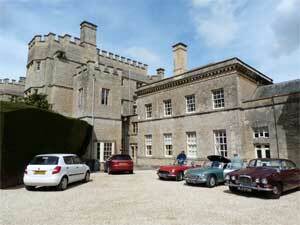 Driving classic motors goes well with group events – fairs, fêtes, carnivals or just trips to good pubs. The club participates in local events where the people attending are keen to see our motors. If dressing up is called for, well we can do that too. We also have our own club outings, often to a motors linked venue. Members make new friends, in good company and a relaxed atmosphere. Club trips are always fun. A dozen or so classics with twenty plus members/ spouses/ partners at a nice place for a weekend is guaranteed to be eventful and amusing. Our adventuresome members go off on major trips in their classics either singly or in company. In 2013 there have been trips to Alsace/ Lorraine, Spain & France via the Santander ferry (joint with TR Register), and an MG Midget touring France for 19 days. In 2012 four cars went over the Alps to Monte Carlo. If that sounds good, why not join us? Thame and District Classic Motor Club is a friendly club of around 70 families who meet on the last Thursday of each month at Chinnor Rugby Club, Thame @ 8.00pm. The club is all about getting the most from your classic vehicle with many events attended through the year by the club, a European tour AND a UK tour. Also our Pride of Ownership Award in July. If you like what you see on here then why not come along to one of our meetings.